Writers Theatre has a new home in Glencoe, Ill., designed by Studio Gang Architects. Thirst designed graphics, including an exterior identity sculpture that uses an outlined version of the WT logo. 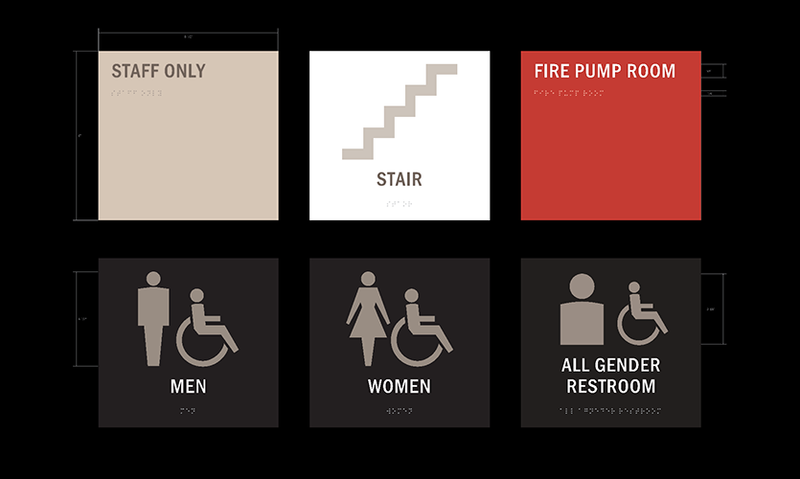 Thirst created signage and graphics that are tightly integrated with Studio Gang's architecture. Animations for digital displays were inspired by the architecture. Everything from new productions to cast listings is content-managed, yet bespoke to Writers' needs. Thirst and Poblocki Sign Company created a unique interior version of the traditional theater season marquee. Individual acrylic letters fit into an architectural feature wall of "woven" wood via a slatwall system engineered by Poblocki. 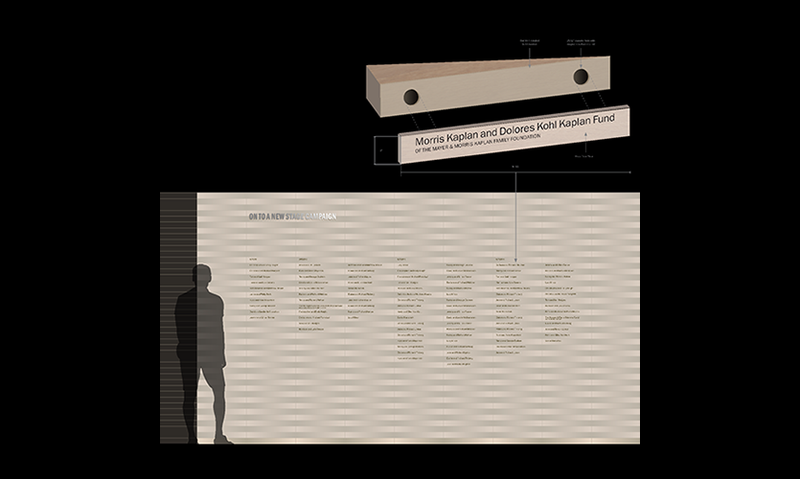 The donor wall also appears to be woven of wood slats. 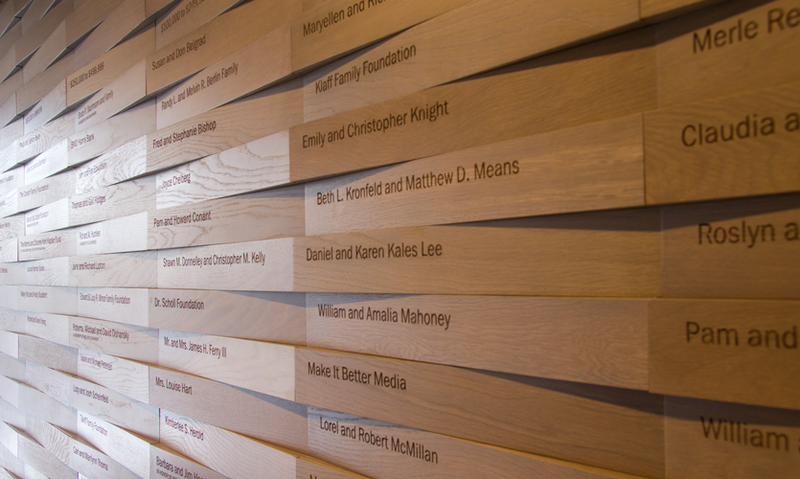 Each name can be removed or replaced easily, but is still integrated into the architecture. Regulatory signage was also part of the project. Thirst also designed an "About WT" bookshelf wall that is a cost-effective way for the theater to curate its own ongoing story. The wall uses digital prints, artifacts and a modular peg mounting system that allows Writers to add new pieces easily. Since it started in the back room of a bookstore in 1992, the hallmark of Chicago’s Writers Theatre has always been intimacy. When it needed more space to grow and survive financially, WT didn’t want to lose that original small-theater feel. 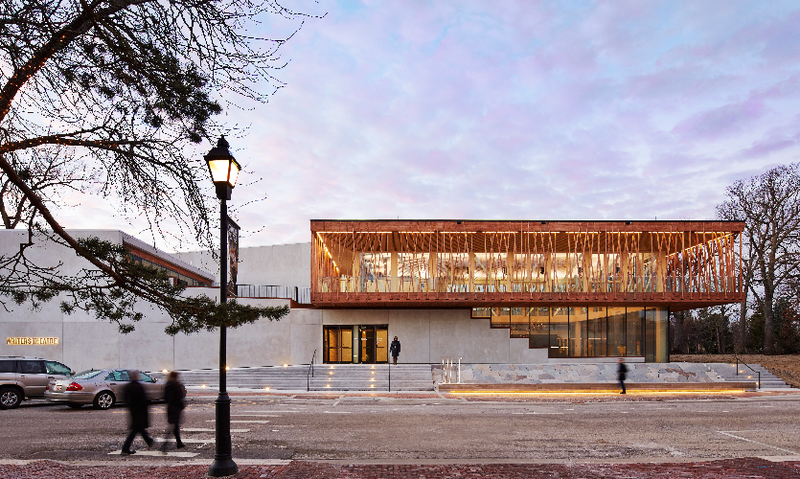 Its new 36,000-sq.-ft facility in Glencoe, Ill., designed by Studio Gang Architects, offers an open, welcoming space that invites the public in and galvanizes the potential of theater to unite people through shared experience. Signage and environmental graphics by Thirst (Chicago) support the flexible, transparent architecture and celebrate Writers’ unique history and spirit. The theater’s most recent home, a 108-seat space in the Woman’s Library Club of Glencoe, wasn’t large enough to support WT’s growth. Meanwhile, the suburb 20 miles north of Chicago was implementing an ambitious master plan to integrate more cultural and commercial spaces in its downtown. Ultimately, Writers partnered with the Woman’s Library Club and the Village of Glencoe to build a one-of-a-kind theater center that would also energize downtown as a vibrant public gathering space. Studio Gang’s solution is anchored by a public lobby/gathering area, two performance venues and an open second-floor gallery walk surrounded by supporting timber Vierendeel trusses and a lighter wood lattice hung in tension from the primary structure. In warm weather, it opens to an adjacent public park and downtown. At night, it glows like a lantern. A rooftop pavilion and green roof provide additional event space. 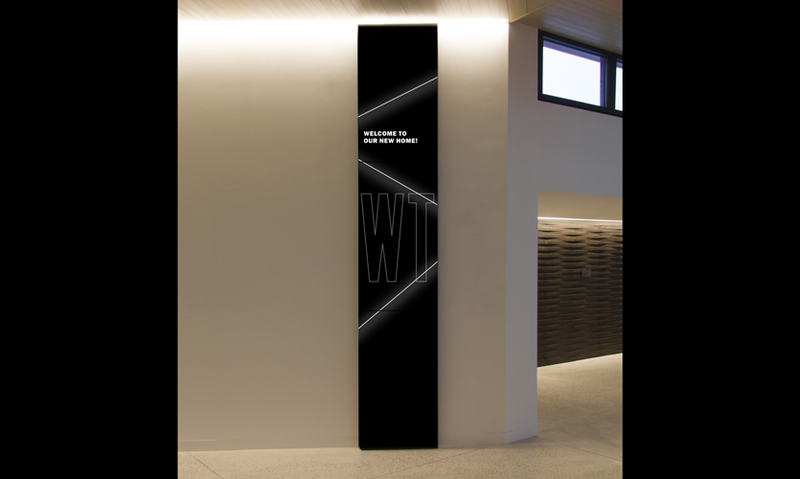 Thirst was tasked with creating signage and environmental graphics that would support and complement the architecture while integrating WT’s existing brand into the space. Thirst’s job started from the outside in, with the building identity. “We wanted to find a way to lighten the visual impact of all signage, in order to bring maximum respect to both the architecture and the neighborhood,” says Thirst’s John Pobojewski. 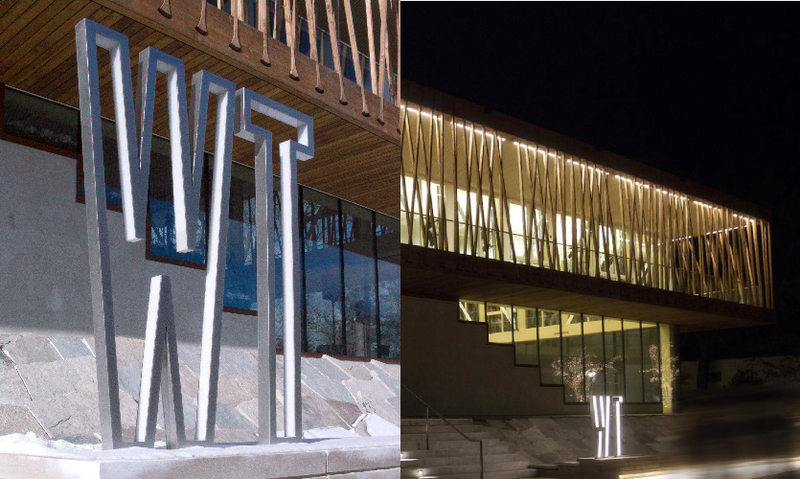 To continue to lighten the visual load, Thirst separated the existing WT logo and word mark—designed by Chicago’s Lowercase Inc—placing the full name away from the sculpture, on the southwestern edge of the building. The façade-mounted sign is also rendered in stainless steel, this time as a halo-lit expression. Poblocki Sign Company fabricated the identity sign as well as the remainder of the signage package. Thirst was also responsible for interior signage, donor recognition and a unique history installation in the space. In addition, Thirst had to accommodate messaging for upcoming productions, information that inherently changes, and often. Integrating all of these elements into the architecture presented challenges, particularly given that Studio Gang’s interior spaces are very open, with little wall space. Information on upcoming productions is essential to a performing arts center, so Thirst had to get creative about how best to integrate this messaging into the architecture. The best solution, Thirst concluded, was a digital one. So the team designed and conceived a digital signage concept that takes cues from the architectural forms. 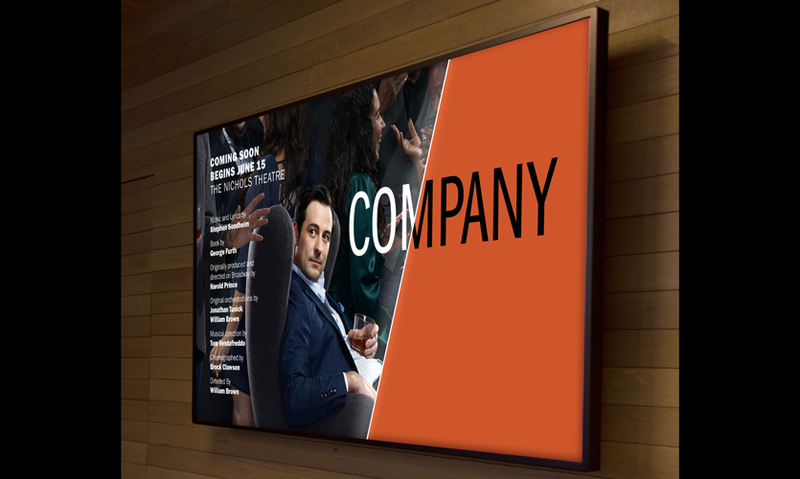 “Most existing digital signage systems are too static and not very sophisticated, so we knew we needed to create something custom that was visually connected to the architecture,” explains Pobojewski. Thirst worked with media production powerhouse Leviathan to help bring the concept to life. Thirst designed the typography, layout and motion design (which mimics the building’s architectural forms) for all messages, while Leviathan engineered and developed the system in TouchDesigner, including a custom content management system that allows WT to sustain the system into the future. The digital system uses components from Planar’s Clarity Matrix video wall—combining three LCD screens into a tall, slim wall-mounted tower. In addition, three stand-alone 16- by 9-in. screens, also by Planar, are located throughout the theatre. All are networked as one system, which was installed and configured by Pentegra. 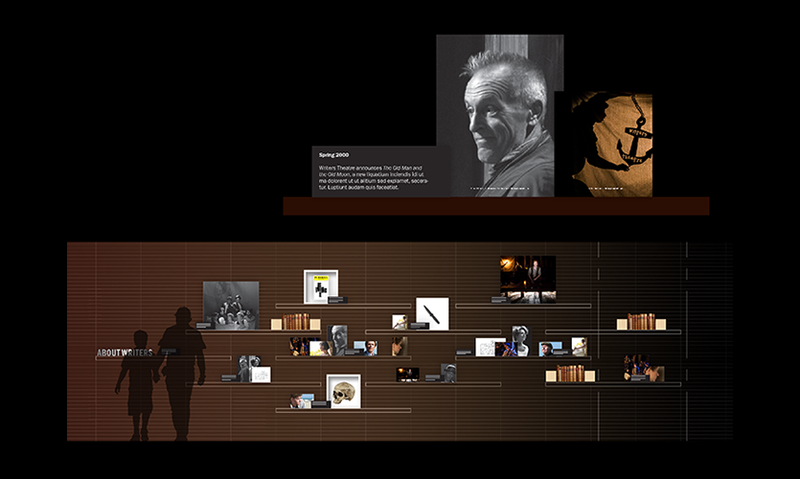 In additional to traditional room identification and regulatory signage throughout the center, Thirst also designed unique graphic elements including an interior marquee wall, a donor recognition wall and an “About WT” history installation. Letting patrons know about the upcoming season’s performances is critical for theaters like WT, so Thirst wanted to create a unique and memorable version of the traditional exterior theater marquee. Studio Gang clad much of the interior wall surfaces in a custom “woven wall” of alternating wood wedges that create an elegant horizontal rhythm throughout the space. 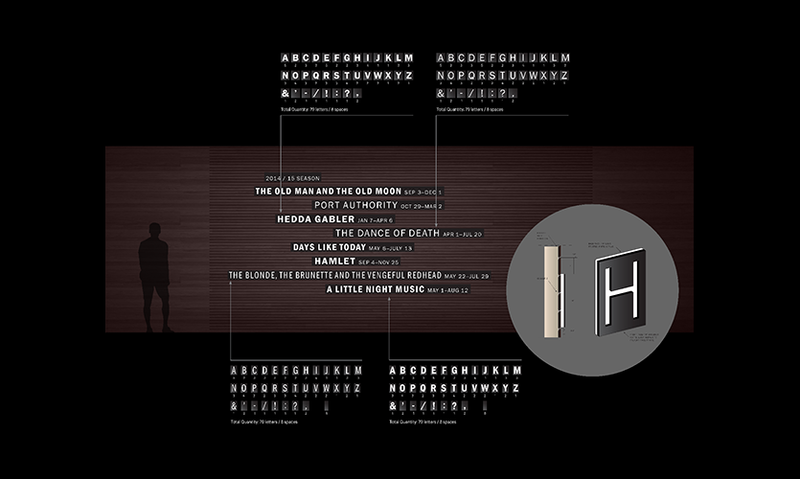 Poblocki integrated a traditional slat wall application together with Cain, the millworker, and created a collection of stand-alone letters that can be used to create the titles of upcoming productions. “The season marquee is made of individual acrylic letters that Writers can arrange on a slat wall to display the different productions from each season, and even custom messages for special events,” explains Pobojewski. 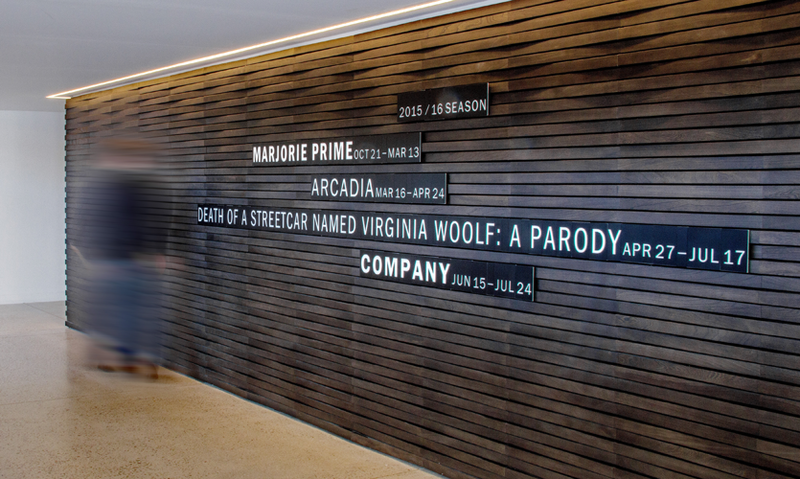 Thirst also designed the “bookshelf wall,” which tells the story of Writers Theater and its history and past productions. Studio Gang wanted to honor the theatre’s humble beginnings in one of the primary corridors. Thirst’s solution was bookshelves filled with images, artifacts and bound scripts from their history. 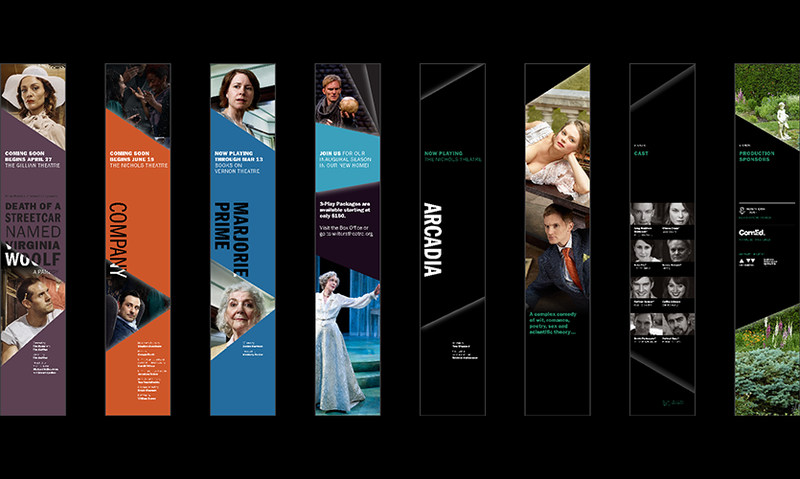 Together with Poblocki, the Thirst team conceived a series of gridded sizes, shadowboxes and display formats that would allow the theater to create and manage the display in a cost-effective way. 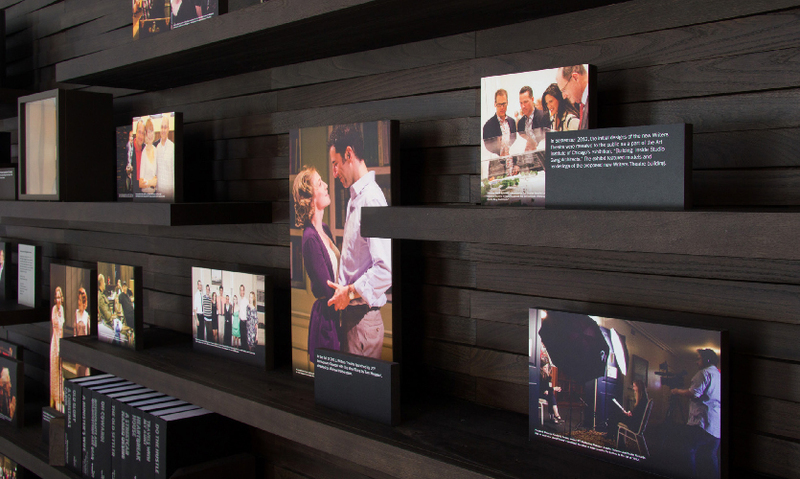 Each panel is a mounted digital print, attached to the shelves with metal pegs on a grid of pre-drilled holes. Custom shadowboxes hold props and other artifacts from their history. Writers curated their own display, which shows both the flexibility and the elegance of the system. The theatre expects to increase its number of people attending performances from 35,000 to 45,000 annually, and the space is quickly becoming a popular gathering spot in Glencoe. For the Thirst team, the project’s success is in how the graphics and signage complement Studio Gang’s reinterpretation of the 21st century theater experience. Project Area: 36,000 sq. 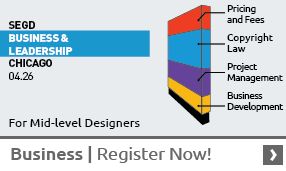 ft.
Find more content in your areas of interest by exploring SEGD's Xplore Experiential Graphic Design index!